Avast, me hardies! 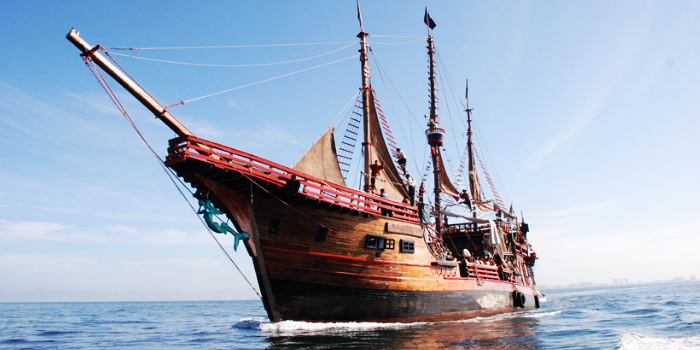 Set sail for an entire day of buccaneer-themed adventure aboard the pirate ship, Marigalante. You'll feel as though you have been transported back in time, when ruthless scallywags pilfered the booty from unsuspecting merchant ships. The children will love this full day of swashbuckling adventure, which includes live performances by the pirate crew, beach activities, such as games, banana boating, kayaking and, of course, snorkeling. Everyone loves a good adventure on the high seas, as seen in the Pirates of the Caribbean Movies. 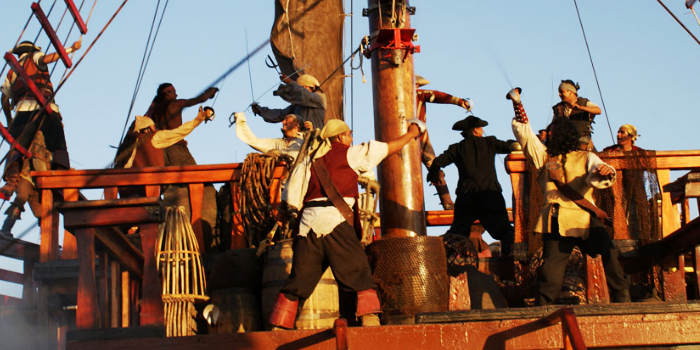 You and your family will feel as though you are smack dap in the middle of big budget Hollywood production as our crew performs a high-flying pirate show. The kids will be truly captivated by the action on the deck of the Marigalante. 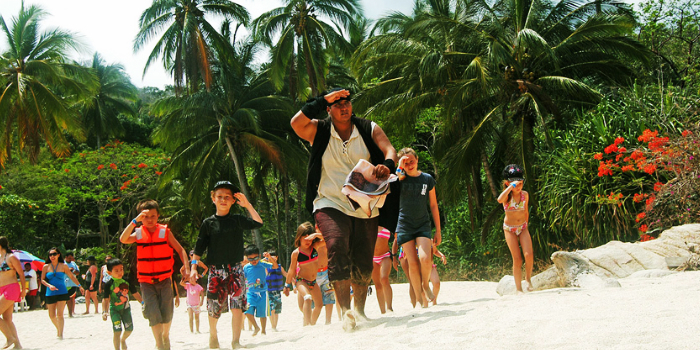 You'll feel as though you've discovered buried treasure after you see the gorgeous beach and pristine cove of Majahuitas where we will spend a good portion of the day. 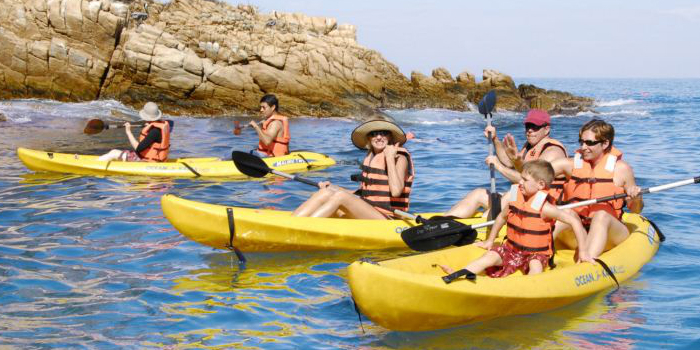 Once we anchor, you'll have the chance to participate in beach games, ride the thrilling banana boat or explore the coastline in a sea kayak. There will be seemingly endless entertainment for children and adults alike. Banderas Bay, with its crystalline waters and thriving coral systems, serves as a habitat for more than two hundred marine species. You and your family will have an opportunity to see some of these amazing underwater creatures while snorkeling above a coral reef bustling with activity. The kids will never forget this first-hand experience witnessing aquatic species in the wild. Classroom study cannot compare to this type of hands-on education, but rest assured that your children will return from vacation thirsting for more information about marine biology. If they love Spongebob Squarepants and Finding Nemo, imagine how their youthful imaginations will react after witnessing the real thing. And you won't be starving for sustenance on this sea voyage, me bucco. Not only do we provide a nutritious breakfast buffet, but also a scrumptious lunch with your choice of three different delicious entrees. The adults can even have their mead or rum, when they take advantage of our open bar. Q: What is the maximum capacity per tour that you operate? 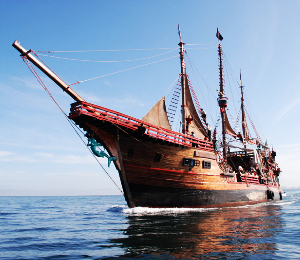 A: Pirate Ship Puerto Vallarta has one Galleon, Marigalante, which has a maximum capacity of 220 passengers. Q: I am vegetarian; is there a way for me to have a vegetarian meal? A: Of course, please let us know at time of reservation. A: Easy, our tours depart from the Maritime Terminal. For the hotels located in Puerto Vallarta Area, any local bus saying Wal-Mart will drop you right in from of the Pier. Local bus cost between $6.50 pesos to $10.00 pesos. Q: Are your ships friendly use for my wheel chair? A: Our ships have very wide space to handle a wheelchair. Plus we will organise for you transportation inside the Maritime Terminal from the main entrance to our ships. Don’t forget to let us know your needs at time of reservation, so we can provide you a better service. Q: Can I have a private group or a wedding on board? Q: I never know how much I should give as gratuities/tips what do you recommend me? A: We recommend $50.00 pesos or $5.00 Dollars per persons. If you feel like your personal pirate deserve more, than feel free to do so. Remember gratuities are always at your discretion. Another $10.00 to $20.00 pesos can also be given to the people who are cooking for you. You can leave your gratuities for them in our dining room at time of dinner. Q: Do I have to bring extra money for souvenirs and pictures? A: Yes, we provide photos and video service on board of our tours. We also have a Pirate Boutique on board where you can buy souvenir. I have been to the Bahamas many times, but Pirate Treasure Land Voyage is one of my favorite trips! It includes everything that everyone should do here. As a Bahamas veteran, I can say only the best about this experience!